Hang tough with these leather Belt Hangers. 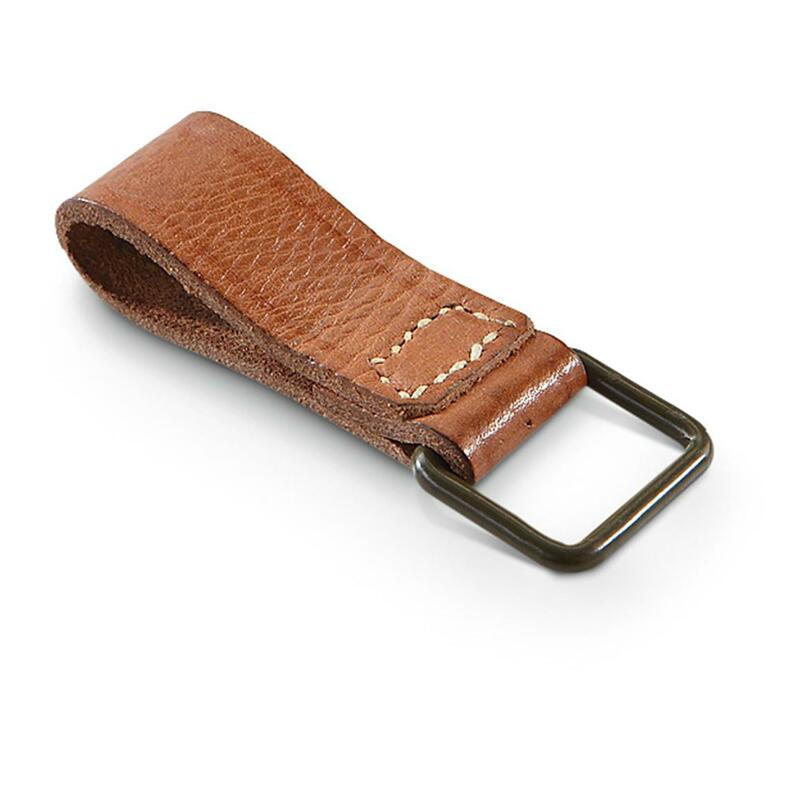 Fits belts up to 1.75 "w.
A handy multi-pack of rugged army surplus leather Belt Loops / Hangers for Czech troops. All ready to attach extra items to gear. Hangers may be riveted or sewn, sorry no choice. Condition: Brand new, never issued. May show signs of long term storage. Czech Military Surplus Belt Hangers, 10 Pack, New is rated 4.7 out of 5 by 12. Rated 4 out of 5 by BDC1 from Better than the last time I bought them These were in really good condition- most appeared unissued. I have bought them in the past which had a large split in the leather on top at the bend. Rated 5 out of 5 by coyote from great and sturdy item second group of these I've bought. Rated 5 out of 5 by Fred from belt hangers these are better than I expected. They are heavy leather and well constructed. Rated 5 out of 5 by RiPfitter from many uses Ordered two sets for this price and all were riveted and in great shape. Snug fit on 1-3/4 in web belt like the East German combat grey wx2-203400. Strong construction multitude of uses. Rated 5 out of 5 by Poopdeckpappy from An excellent belt tab This belt tab is in very good condition, the leather is strong and the metal shows very little wear or corrosion. I use one on my pants every day for a key hanger, and when hunting as a connector for suspenders. they work great in both situations. Rated 4 out of 5 by DAVID from Looks good. Rated 5 out of 5 by WILLIAM from plan on using these for some custom knife sheaths I will be making. Got 'em, threw 'em in a ziplock with baby oil, shake and marinade overnight, supple, good to go. I should probably buy more.